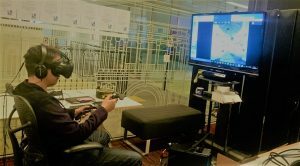 BBC Taster allowed us to test the the technology and editorial potential for Virtual Reality at the BBC in a variety of different ways in 2016. We worked closely with teams like the BBC’s Natural History Unit who have always led the way in capture technologies for TV & who are now hungrily moving into storytelling in VR. Sir David & The Giant Dinosaur was supported by BBC Taster & BBC Earth investment, and made for Samsung Gear VR & also released onto You Tube & Facebook. 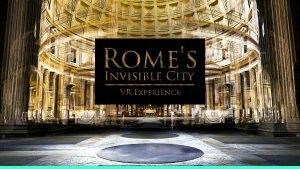 Rome’s Invisible City was the first browser based VR experience on Taster. This was possible thanks to the hi-res scans used for the TV series which were re-rendered for a VR experience, with a new voiceover from Alexander Armstrong to guide users around ancient Rome. This proved popular enough for the TV production to pick up the idea and repeat it for the second series (although it had to be reduced back to 360 video) which has recently been broadcast on BBC 1. A handful of more immersive game engine experiences were piloted with teams in BBC R&D partnering with agencies like Aardman & VRTOV to explore what platforms like Oculus Rift could offer. In 2017 BBC Taster won the inaugural Broadcast Digital Award for VR with “We Wait” Aardman’s experience that transports you to the hear of the Syrian refugee crisis. Inside BBC Studios we secured our first VR commission for “Home”, a virtual space walk for the HTC Vive. Based on the training astronaut Tim Peake had to endure “Home” was a collaboration between BBC Learning, BBC Science and the virtual reality and creation production agency Rewind. Home was produced and delivered by our Digital Storytelling Team’s Technology Lead, Tom Burton.